Not enough space or money for a standard-sized air hockey table? 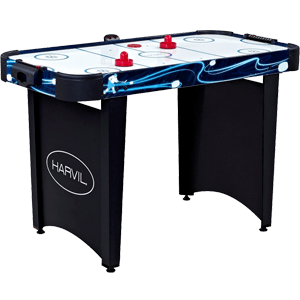 Here are reviews of the best kids air hockey tables models as well as kids air hockey game that suit fit small apartments, small budgets, and small children. 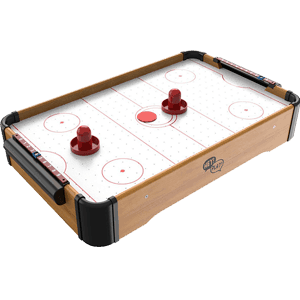 For some people, air hockey is serious competition, and only standard sized models will do.But for the rest of us who are comparatively more casual gamers who just want to pass the time, the best kids air hockey table can be more than enough for lots of fun. 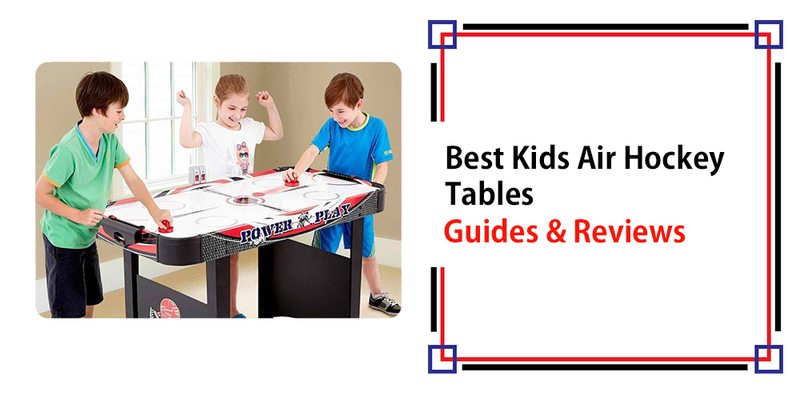 Here’s a quick look at some of the kid air hockey table models you can choose from:It offers a lot of advantages when the air hockey table isn’t too big. When the air hockey table is a bit smaller, it can be played by even younger players who can then join in the fun with older siblings, mom and dad, and even grandma and grandpa. It’s a better for small rooms and cramped apartments. The price is just right too. It’s more portable for fun at the beach or in the park, and at home it isn’t really a problem to store it away. This measures just 40 by 20 inches, and this size makes it very affordable. But it’s compact without being too small, so the older kids can still use it. And the younger kids will find the size just right. This only measures 5 inches high because it’s a tabletop model. You only have to put it on a table and the gaming fun can begin. Because it’s so compact and the 10-pound weight is virtually negligible, it’s very portable. You can move it from the living room to a bedroom with no problem. You can also bring it along when your family goes to the park or visits with the grandparents. ​And at home, it’s fits in well with small apartments.Now it may be affordable because of the low price, but that doesn’t mean that it was constructed from substandard materials. The fan motor is very reliable in offering the air that makes the gameplay continuously fast-paced. The manual scoring system is simple yet effective. It’s made from durable high quality wood, so you can expect years of service from this. 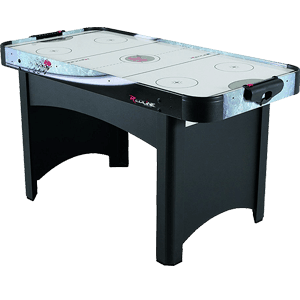 All you need to do is to find a table that’s level and secure, and you can put this air hockey table and begin playing. You can even use a good table here without having to worry about the legs of the air hockey table scratching the table surface. The rubber feet make it safe for all types of table surfaces. The fan is nicely quiet during game play, and the assembly is straightforward and simple. All on all, it’s a great kid-sized air hickey table that even adult-sized kids will want to play with. This is also another tabletop model, so it’s very easy to bring along wherever you and your kids go to the park or to a holiday vacation. It doesn’t have legs, so you can just put it on any convenient table and your kids can start playing. This air hockey for kids very easy to just put it in your car trunk. With this size, it’s just right for smaller kids. It’s very simple-looking too so it isn’t very distracting. The strikers are well-suited for the hands of smaller players, while the size of the puck fits the table’s dimensions. 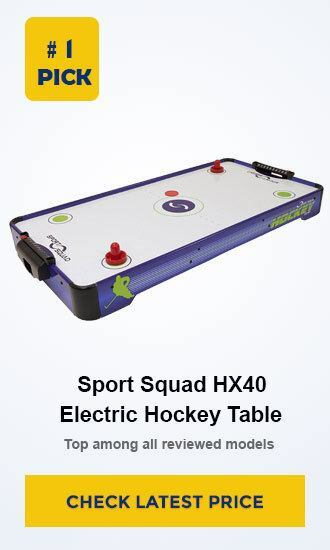 You’d think that at this size and price point it’s a cheap table hockey model with the “air” components, but you’d be wrong. But it does come fitted with a strong 100-CFM motor that blows enough air for the whole playing surface. 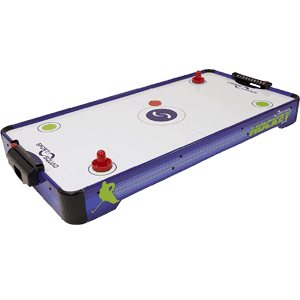 So like any other real air hockey tables, the movement of the puck is smooth and fast-paced. 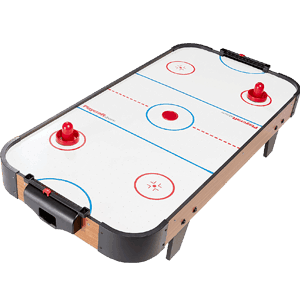 And with the manual scoring system, the game won’t be interrupted by arguments about what the score really is.Kids can be very rowdy, however, and so flimsy materials won’t cut it for air hockey. But Playcraft did anticipate this by making the tabletop model sturdier than you’d expect. The tough MDF hardwood frame is well-geared towards rambunctious kids, and so you can expect this to last for years, or at least until they’re old enough to want a much bigger table. That’s not to say that it’s not fun now. It’s an especially enthralling game that encourages kids to interact with each other directly, instead of online or over a TV screen. What’s more, the game is very familiar with many adults, and kids can play with the older members of the family for some poignant family bonding moments. 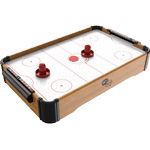 This model is a mini table top air hockey , and that makes it even smaller than the compact models mentioned first on this list. This is to make it really portable, because it’s just the size of a tablet. It’s only 22 inches long, and that’s a handy size for kids. They can bring it to school, to the park, or to their friend’s house. They can just put it in their backpack, as the 5-pound weight doesn’t really mean much. Or your kid can just play this at home with their siblings or parents. They can play with their friends when they come over, or when the babysitter comes. Teenage babysitters can enjoy this too. Ironically, some parents also use this as a sort of mechanical babysitter so kids don’t get bored while the patent are busy with chores. Even in this size, it still brings the “air” in air hockey. It does come with a blower to, so the puck glides over the playing surface instead of rubbing against the playing surface. 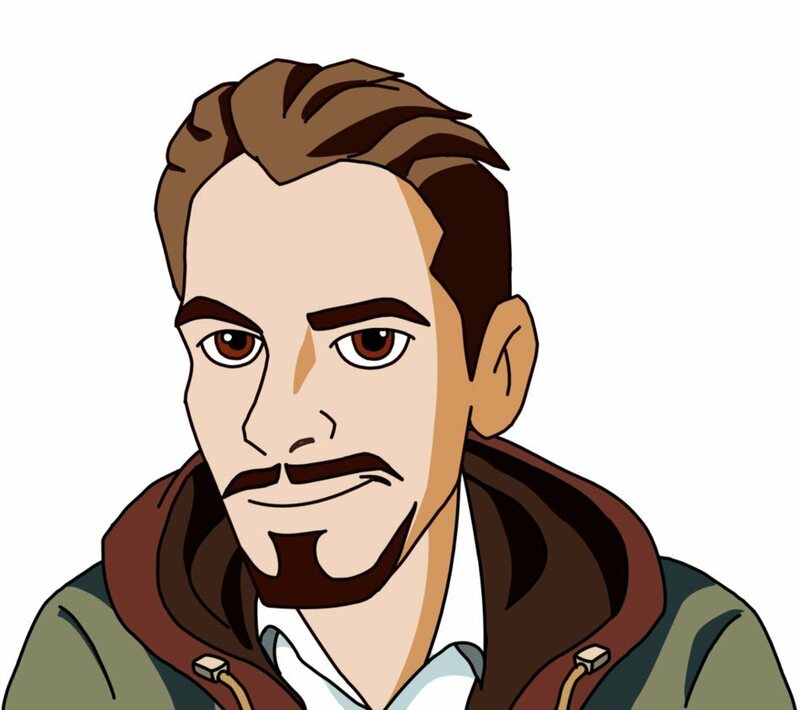 And because portability is one of the main selling points, it doesn’t need to be plugged in. Instead, you just need 6 AA batteries. This makes it perfect for playing in the park.It’s very easy and simple to assemble, and that’s not only because it’s so small. Most of the parts have already been preassembled. And as for the assembly tasks you still need to do, they’re very simple. The package even includes a screwdriver in case you don’t have one at home. 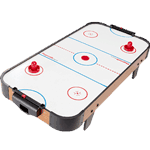 In total, this best air hockey table for kids are very affordable portable air hockey table that’s built with high quality materials. It promises a lot of fun, and even adults can use this to pass the time. Not all kid-sized models are geared towards tiny tots.Some are specially designed for older kids, and this one is a good example. It’s a proper table with legs, and it’s meant to be played at home.Not that as a parent you’d be aghast to have this in your game room or even living room. This table actually looks very nice, and the legs are very secure and robust. It won’t be surprising if you have gets and sooner or later some of the adults will be tempted to play with it. The size is quite ample, and for older kids the dimensions are right. It measures 54 inches long and 27 inches wide. So that makes it a nice size for adults, but not too big for younger children. At a height of 30 inches, even first graders will find the size challenging but not impossible to play with. The gameplay is also exciting enough for older kids and even adults. But the younger kids will find this very engrossing indeed. The pucks and strikers are suited for the hands of younger players, while the fast pace provided by the air motor is powerful enough to cover all the spots in the playing surface. The manual scoring system is simple enough for young kids, so that it can settle disputes about the right score. This table build is very sturdy, as it uses MDF and plastic materials. It stays in place while people play, but the light weight allows you to move it into the bedroom or out to the patio any time you want. When you have young kids start with this, it can provide years fun without the need to upgrade for a bigger model altogether. 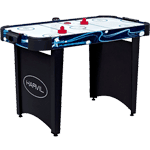 This is another well-constructed air hockey table that kids can play with, while the adults can also join in the fun. The material is very strong since it uses MDF wood, and it’s also safe because it’s certified by CARB. It stays in place nicely throughout the gameplay, as it weighs 40 pounds. The adjustable leg levelers will help you make sure that the players have an even surface to play with. The table does offer sizable dimensions, as it measures 54 inches long and 26 inches wide. This playing surface is still substantial at 48 inches long. The height of the edges measures at 0.625 inches, so the edges are very effective in keeping the puck in the playing surface. It’s very easy to assemble, and the air blower needs to be plugged in. The scoring system is even electronic, and it needs just a couple of AAA batteries. This is fun for the whole family. It can actually be argued that these small gaming tables offer huge fun for families. Air hockey is a great way for families and friends to bond, and you won’t have to exclude the younger tots. You can also pick these models for smaller homes. 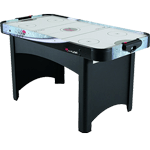 With the lower cost and the easy assembly, these best kids air hockey table models should offer many years of happy family memories.Fianlly you can call it childrens air hockey table also.